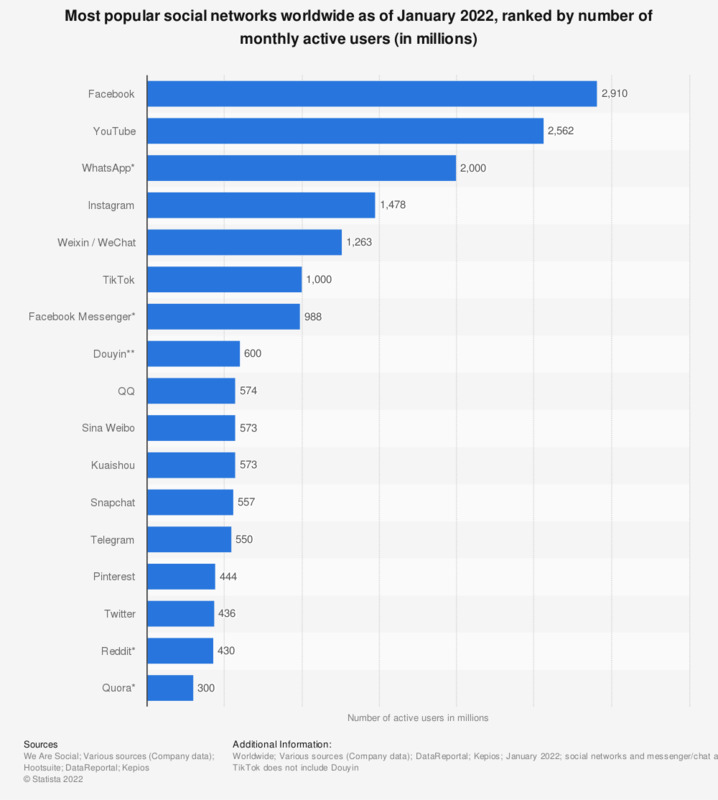 This statistic provides information on the most popular networks worldwide as of January 2019, ranked by number of active accounts. Market leader Facebook was the first social network to surpass 1 billion registered accounts and currently sits at 2.27 billion monthly active users. Sixth-ranked photo-sharing app Instagram had 1 billion monthly active accounts. The leading social networks are usually available in multiple languages and enable users to connect with friends or people across geographical, political or economic borders. Approximately 2 billion internet users are using social networks and these figures are still expected to grow as mobile device usage and mobile social networks increasingly gain traction. The most popular social networks usually display a high number of user accounts or strong user engagement. For example, market leader Facebook was the first social network to surpass 1 billion monthly active users, whereas recent newcomer Pinterest was the fastest independently launched site to reach 10 million unique monthly visitors. The majority of social networks with more than 100 million users originated in the United States, but European services like VK or Chinese social networks Qzone and Renren have also garnered mainstream appeal in their areas due to local context and content. Social network usage by consumers is highly diverse: platforms such as Facebook or Google+ are highly focused on exchanges between friends and family and are constantly pushing interaction through features like photo or status sharing and social games. Other social networks like Tumblr or Twitter are all about rapid communication and are aptly termed microblogs. Some social networks focus on community; others highlight and display user-generated content. Due to a constant presence in the lives of their users, social networks have a decidedly strong social impact. The blurring between offline and virtual life as well as the concept of digital identity and online social interactions are some of the aspects that have emerged in recent discussions.